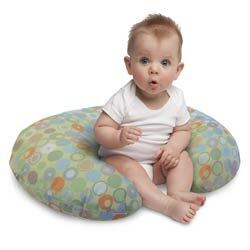 The versatile Boppy Bare Naked Pillow helps you ergonomically position your baby during nursing and feeding, providing comfort to both of you. Designed with an expandable midsection that accommodates all waist sizes, the machine-washable pillow is firm and retains its shape. The C-shaped pillow also can be used to prop up your baby after feedings, as a tummy time aid when your baby grows older, and to support baby when learning to sit.